Deluded Democrats cannot accept the fact they were lied to for over two years straight by media hacks and politicians who repeatedly claimed Donald Trump "colluded" with Russia. 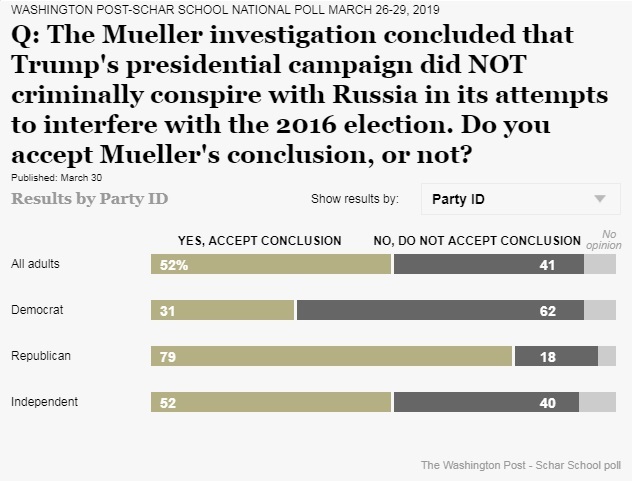 According to a Washington Post/Schar School poll released on March 30, 62 percent of Democrats "do not accept" the conclusion of Special Counsel Robert Mueller's investigation. Only half that number -- 31 percent -- said they accept Mueller's findings that Trump did not collude with Russia. They just can't accept the fact they were lied to -- for profit -- and played like suckers by pundits and politicians who view them as idiots and hold them in contempt. They can't accept the fact folks like myself -- who called this witch hunt a fraud on day one and said it was nothing more than a deep state pressure tactic to sabotage Trump's presidency -- were right. For the record, odds are the only reason Mueller decided not to frame Trump is because he and the deep state actually succeeded in the goal they set out to accomplish. They sabotaged Trump's presidency, took out everyone in his cabinet who was viewed as a threat to establishment and kept the neocon Cold War with Russia going strong. We're still in Iraq, Afghanistan and Syria and neocons like John Bolton appear to have successfully sabotaged Trump's peace talks with North Korea. Additionally, our borders are wide open and military spending is near-record highs. This is what The Resistance� call "winning."